I wanted to give my hands a go at decorating a cake with a bit of fondant. 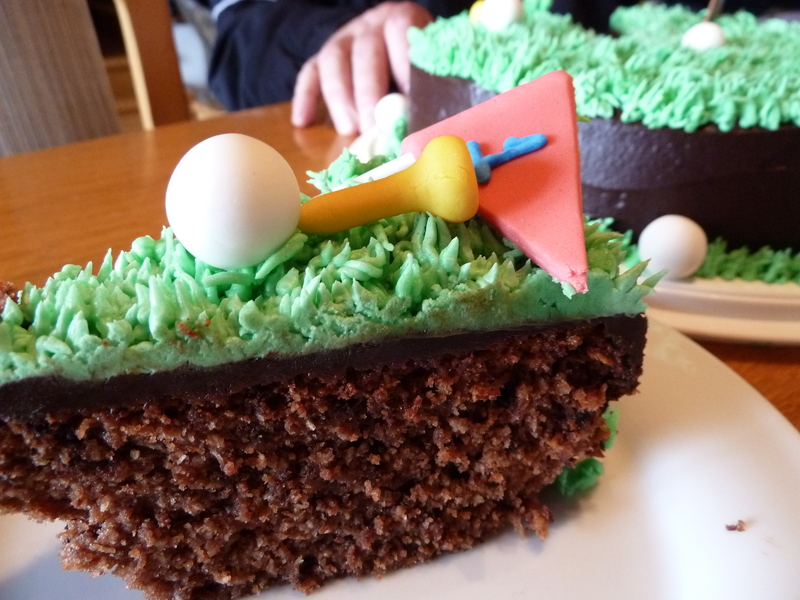 So for Father’s Day I made a golf cake for my father-in-law who has just taken up golf and is getting addicted. He always wondered how my husband and I could be so addicted to golf but now he knows. Once you get the hang of it and start hitting the ball and hear the *ping* it’s like music to a golfer’s ears. The cake is a yoghurt cake, no butter needed. 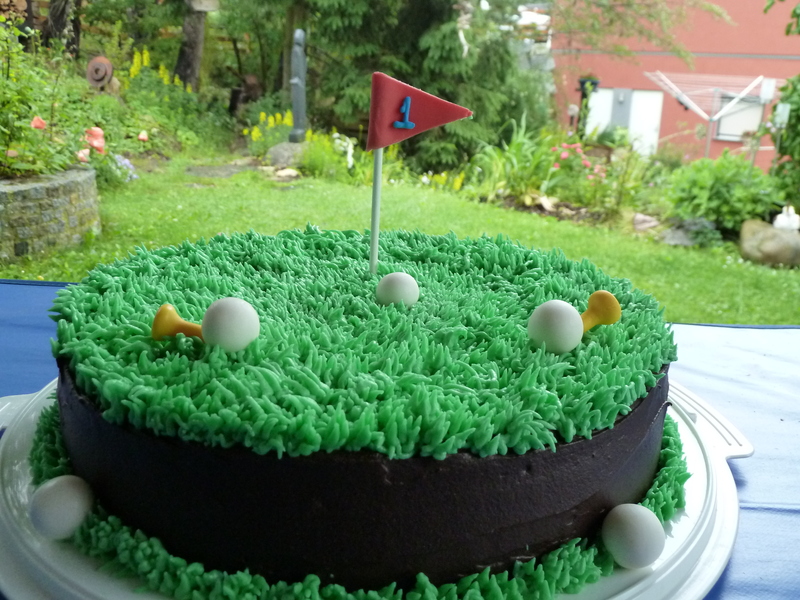 The whole cake was then covered with a bitter chocolate ganache, decorated with buttercream grass and fondant golf balls, tees and a flag. I first came across yoghurt cakes here in Austria. They are so easy and simple to make, no need for creaming butter and sugar or folding in flour. You just measure everything using the yoghurt tub, mix and bake. Grease and flour your desired cake tin or cupcake tin. Mix all ingredients with a handmixer till they are well incorporated. Pour cake mix into greased tin and bake for approximately 50 minutes* if using a cake tin and approximately 20-25 mins if using cupcake tins or until a skewer comes out clean when poked in the center of the cake. Remove from oven and let it sit for 5 minutes before turning it out onto a wire rack to cool. *Note: If using a bundt tin it takes approximately 50 minutes. If using a 9 inch cake tin it takes approximately 1hr 15 minutes. Whip the butter on medium-high speed of an electric mixer for 5 minutes. Reduce the speed to medium-low and gradually add in the sifted powdered sugar, mixing and scraping the sides of the bowl until all is incorporated. Add the milk and vanilla essence and mix until incorporated and fluffy. If the frosting appears a bit too soft, add some additional sugar, one spoonful at a time until the desired consistency is reached. Spread the chocolate ganache all over the cake. 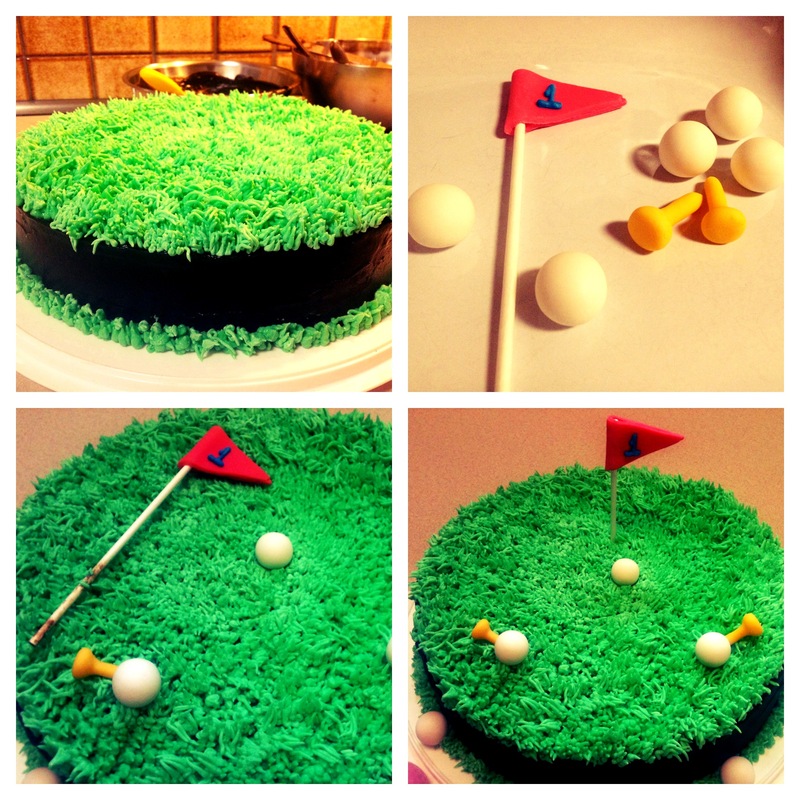 For the golfing green I used a Wilton grass tip 233. I used small amounts of white fondant and rolled them into balls. For the tees I coloured a small amount of white fondant with yellow food colouring and shaped them into a tee shape. For the flag I coloured some white fondant with red food colouring, rolled it out flat, folded it in half and cut it into a triangle. I used a lollipop stick to attach the flag and for the ‘1’ I used Wilton icing from a tube. Now all that is missing is a cute golfer figurine. Hi Laura, thank you. My father-in-law loved the cake too, he was very intrigued with the grass 😉 I look forward to exchanging tips & tricks as your cake decorating is just absolutely amazing!! Thanks for the recipe Angela. Tomorrow is the day ! I am going to give the yogurt cake a try. Its for Mia’s Birthday party on Friday. You’re welcome. 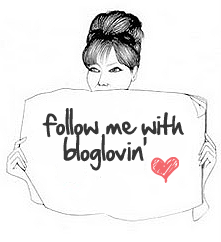 Please do let us all know how it turns out, I’m sure it will be great & Mia will love it. Just remember if you use a round tin & not a bundt tin then bake for approximate 1hr 15 – 30 mins – till the skewer comes out clean.